Real ITSM vs ITILITIL presents “best practice” (ITIL Version 3 wimped out to “good practice”), an idealised model for us all to aspire to. ITIL is all very well for theorists, academics, consultants and IT managers, and all others similarly detached from reality. Down here in the real world, at the coalface, an entirely different model prevails: Real ITSM, which represents Real Practice. 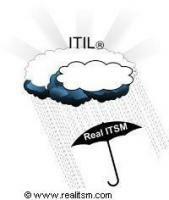 Real ITSM involves its own lifecycle, activities, roles and metrics, analogous to those of ITIL but entirely different. They differ because, unlike ITIL, they must engage with the real, physical world, populated by “wetware” - those cussed, unpredictable and generally useless devices known as People. When any idealised model meets People, the laws of logic are suspended, and rationality flies out the window. When ITSM frameworks go through this realitsm transformation, the output is Real ITSM. Most BOKs are process-centric. Real ITSM is people-centric: it understands that what really happens is dependent on the people – their motivations, culture, personal agendas, fears and desires. Submitted by guest on May 16, 2012 - 07:34.